Tom Kowalczk is the Director of Remote Sensing for the Cleveland Underwater Explorers (CLUE) and an avid shipwreck hunter, experienced researcher, sidescan sonar operator, and scuba diver. As a life-long resident of Ottawa County, Ohio, Tom grew up fishing and diving in Lake Erie. He began diving shipwrecks in 1965 and has been researching Great Lakes history ever since. He holds an International certification of safe scuba diving from NASDS and is a past scuba diving instructor. 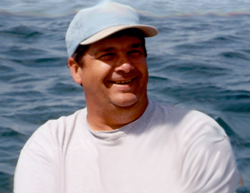 Active in the Great Lakes community, Tom is a board member of The Association of Great Lakes Maritime History (AGLMH) and a member of the Great Lakes Historical Society (GLHS) and Save Ontario’s Shipwrecks (SOS). The steel tank barge “Argo” recently made the news when its discovery was announced on October 25, 2015, at a joint conference with the U.S. Coast Guard (USCG), GLHS, and CLUE at the National Museum of the Great Lakes in Toledo, Ohio. The “Argo” sank 78 years prior on October 20, 1937, in a storm in western Lake Erie. 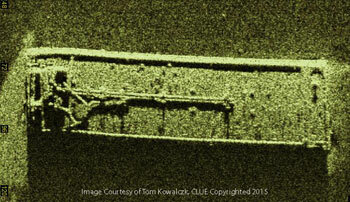 Its final resting place was never determined until the shipwreck was located by Tom Kowalczk on August 28, 2015. It sank with roughly 100,000 gallons each of crude light oil and benzol and was listed in 2012 by NOAA as the top environmental threat in the Great Lakes for sunken vessels. The wreck was discovered to be leaking by CLUE, prompting a major response from the USCG. Tom will discuss the history of the barge, its sinking, the discovery of the wreck, and the successful cleanup that was performed afterwards.